Albrecht D�rer (1471–1528) was a German engraver and painter whose fame and influence reach far beyond national borders. Famous for his graphic work; his engravings and woodcuts; in D�rer's time woodcuts are used to illustrate books. D�rer was born in Nuremberg where he spends most of his life. After his apprenticeship he marries Agnes Frey in 1494, only to leave for Italy the very same year. Among the objects he studied in Italy were woodcuts by Andrea Mantegna. Back in Nuremberg he creates among other works the 15-part Apocalypse. In 1512 he is employed by Maximillian of Austria, who grants him several commissions. D�rer strives for artistic liberation for North European art, thereby following the Italian Renaissance - to be free of the restrictions of traditional methods and more room for creativity and emotion. D�rer dies in Nuremberg in 1528. 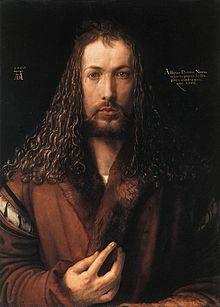 The portrait on this page is a self-portrait from 1500, when he was 28 years old. D�rer was one of the first artists to portray himself. He left a vast oeuvre: about 60 paintings, 250 woodcuts, 100 engravings, 6 etchings and more than 1,000 drawings and watercolours. From October of 1916 through January of 1917, Rudolf Steiner gave a series of nine lectures known as the Art Course. These lectures were given the title of: The History of Art. Click here to discover what Steiner said about D�rer in the third lecture, or in the entire lecture series.